Wikimedia Commons, Creative Commons 3.0 Unported License. Author: MissMJ, 27 June 2006. Detail of a 90" drawing, representing the magnetic fields generated in the magnets at Fermilab. My workspace has some unusual supplies for an artist’s studio. Pinned to my idea board I have a list of subatomic particles, quotes from popular physics books, the names of inspiring physicists, and a picture of Nobel Laureate Marie Curie. I use my art to explore and explain how particle physics underpins all of life. As Fermilab’s first Artist-In-Residence, I found making art about physics was an act of discovery. Using science and art together not only energized my studio practice, it changed the way I see our universe. On my first day at the lab someone handed me a book, The Quantum Frontier, by Dr. Don Lincoln, senior scientist at Fermilab and co-discoverer of the Higgs Boson Particle. Lincoln explains the Standard Model of particle physics: a breathtakingly successful conceptual tool used to explain our universe. Most people are familiar with the periodic table used to organize chemical elements; the Standard Model organizes and explains subatomic (smaller than an atom) particles and the forces (gravitational, electromagnetic, weak, and strong) that govern them. It tells how the cosmos in which we live can be explained as endless combinations of key subatomic particles, governed by a handful of principles. Lincoln’s approach to explaining the Standard Model was perfectly pitched to me, a non-scientist. Many scientists at Fermilab generously spent lots of time explaining various aspects of physics to me. This is not to say I did not struggle with the material. In fact, I wrestled with these ideas for quite some time. One of the biggest obstacles to learning about particle physics was accepting that the way particles behave in the quantum realm is counterintuitive to the manner in which we perceive reality. For example, objects that appear solid to us are in fact made up of a field of wiggling, jiggling particles. I was attracted to the Standard Model because while there are deep implications embedded in its mathematics, on the surface, it looks simple. The Standard Model can be used to explain the basics of particle physics to junior high students and yet holds deep mysteries for scientists working at the top of their field. The act of researching and creating these images taught me about the relationship between types of matter, the behavior of the strong force on quarks, and how the Higgs field interacts with particles, to name a few. The optical and intellectual challenge of finding visual metaphors to express this exciting research was intriguing. I created a number of works during my two-year residency at Fermilab, which are grouped by several topics: pieces representing the Standard Model, others that illustrate specific particles and data, and still more that relate to the complex and fascinating instrumentation that is required to study particle physics. Many artists use oil paint, watercolor and other traditional materials. But when I work, I want to use media to reinforce the message in the art. The materials I use for each project are as much a part of the work as the subject matter. I want to figure out a way to have the least amount of distance between the viewer and the art. 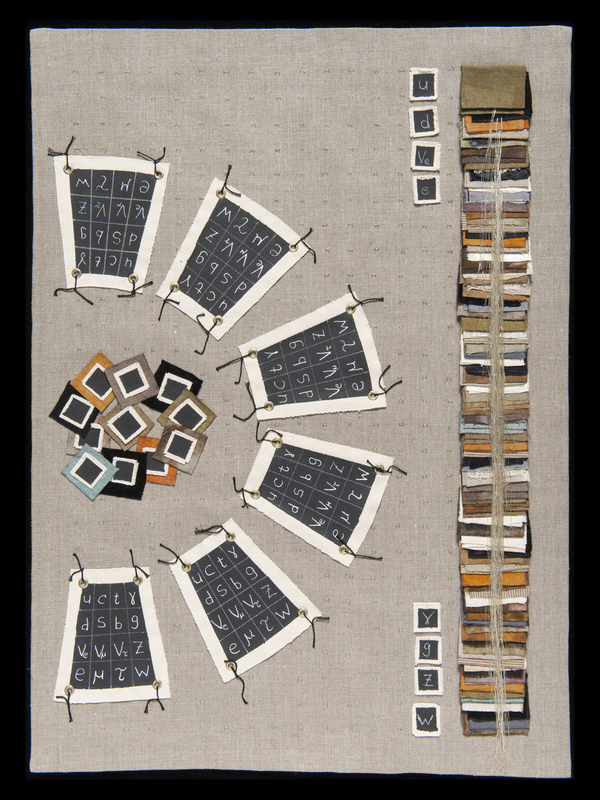 Everyone uses textiles in their daily lives, so creating work in them felt like a natural choice. 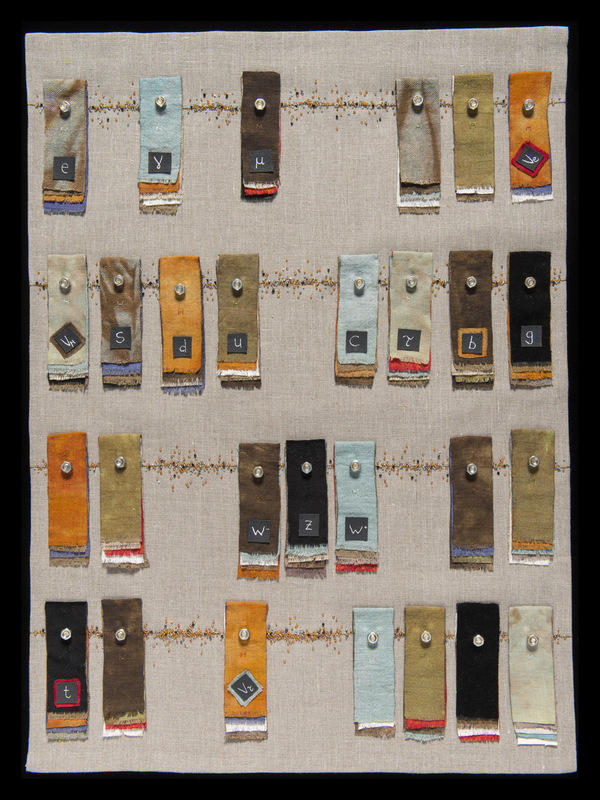 In artwork related to the Standard Model (pictured here: “Nuts and Bolts,” “Discoveries,” “X and Y Axis”), I used a raw linen base and dyed textiles (silks, denim, cottons) that suggest the colors of antiquity, to represent the ancient study of physics. I also used a lot of time-consuming hand processes in making the pieces: beading, embroidery and hand sewing. Historically, beading and hand embroidery were used on the clothing of royalty and the wealthy. Using these sorts of processes to create the art elevates the subject matter. “Nuts and Bolts” is a beaded timeline suggesting a sort of royal road to the discovery of particles. The pieces are human-sized. Physics deals with scales that are both infinitesimal and cosmic; I wanted to use a scale in the artwork that would invite the viewer into a subject matter that might feel intimidating to non-scientists. I chose a grid format in all the Standard Model pieces not only to visually anchor the work, but to hint at the graphs used when analyzing data. The works include the history of particle discoveries and the measurements necessary for these observations. I’ve created a visual metaphor for books, but these books do not look completely finished, suggesting the unfinished business of scientific inquiry. The Standard Model has been hugely successful in predicting particles including the Higgs Boson, the existence of which was experimentally confirmed in 2012. However, physicists know the Standard Model does not tell the complete story. In “Discoveries,” a short version of the Standard Model equation looks provisionally attached to the piece. I am expressing the idea that the Standard Model may have to be substantially changed due to new discoveries. Because I don’t want my art to become obsolete, I left room for the undiscovered particles in the center of this piece. And hidden in every piece is a reference to the Higgs Boson, that master of disguise that eluded detection for over 20 years. If you take a look at the pieces up close, you can have your own sort of “Where’s Waldo” experience trying to find how I represented the Higgs Particles in the art. At the Newberry Library in Chicago, I had an opportunity to study medieval illuminated manuscripts. 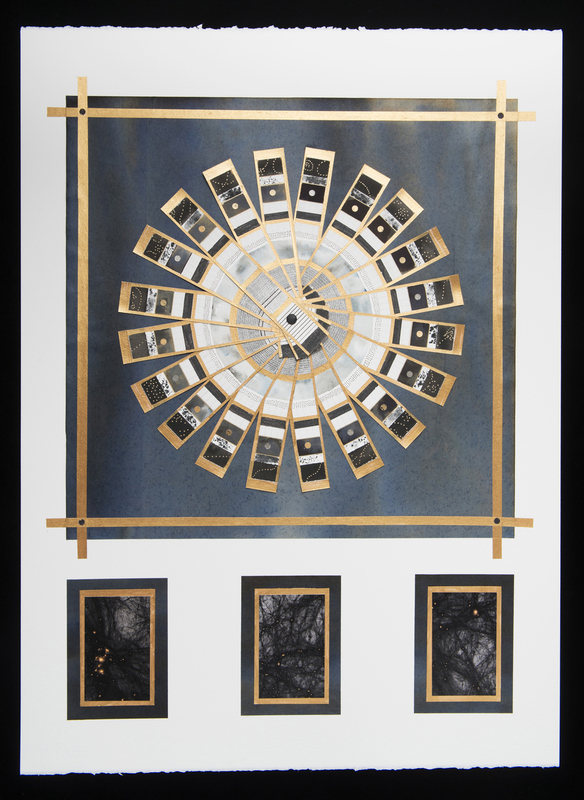 The study of these beautiful books inspired me to combine particle physics and the format of an illuminated manuscript to create my own modern artist books. Medieval manuscripts were used to transmit the most important information of their day; my books illustrate the deep and fundamental connection between the origins of the universe and particle physics research that occurs at particle accelerators (pictured here: “CMS III”). 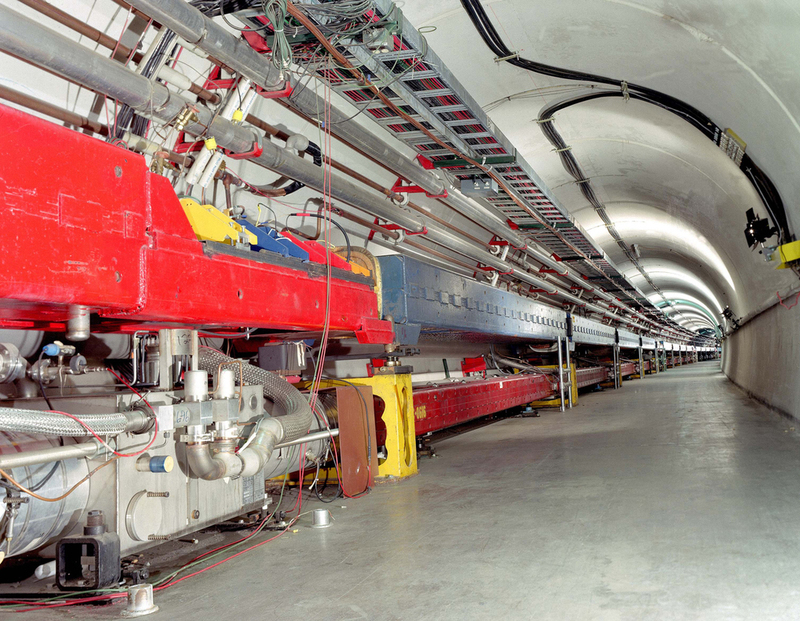 In experiments using accelerators such as the Large Hadron Collider at CERN, the European Organization for Nuclear Research, particle physicists recreate the conditions that existed in the early universe. By smashing protons together at high energies, the resulting reactions illuminate conditions in the early universe. Why do the forces have such disparate strengths and ranges? Is there something smaller inside quarks and leptons? Our universe is permeated with neutrinos — nearly massless, neutral particles that interact so rarely with other matter that trillions of them pass through our bodies each second. Neutrinos emanate from the earth, from the sun, they arrive from the distant cosmos – and neutrinos are manufactured at Fermilab with sophisticated technology that begins with a bottle of hydrogen. In “Dark Glamour: Neutrinos I,” I used three miles of metallic embroidery floss to portray the billions of particles in the beam created at Fermilab. The constructed curtain falls as an elegant cascade of metallic fibers and suggests a theatrical space: a stage for the presentation of a set of these mysterious particles. 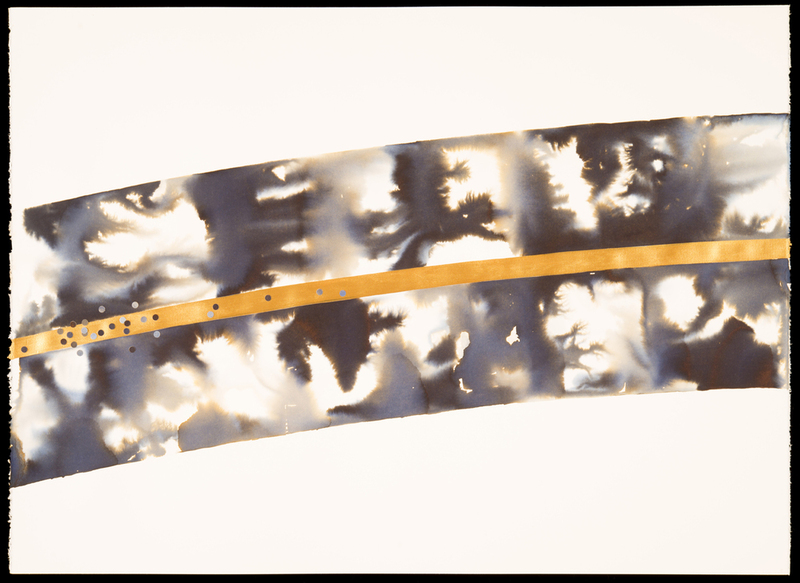 Subtle shades of silver, steel, and gold represent the three states of neutrino particles. We don’t understand yet why these particles oscillate between these three states. In “Dark Glamour: Neutrinos II,” the visual metaphor of a net suggests how detectors capture images of these rarely interacting, elusive particles. The neutrino detector is represented by velvet squares joined by lines of beads in three subtle colors, again to express the dynamic nature of neutrinos. The art borrows techniques used in high fashion to project an image of dark glamour. One of the most interesting parts of my residency involved shadowing operators who maintain the beautiful machinery that delivers a high-energy beam of particles for scientists to study. The staff in the Accelerator Division is responsible for producing the best beam possible by using the most up-to-date accelerator science. Understanding how the energetic beam behaves showed me that nature is not just about birds and fluffy animals; fundamental particles are part of nature too. Because the particles in this beam all have the same charge, they want to spread out. More than 1000 superconducting magnets, strategically placed around a large ring called the Main Injector, steer and compress the particles while they travel near the speed of light. Then they are shot into a target. Sometimes, but rarely, neutrinos collide with other particles and scientists can use that information to study their behavior. Without this complex instrument, neutrinos interact so rarely that it would be almost impossible to study them in one person’s lifetime. The “Dipole Magnet” drawings celebrate the nature of the particles in the beam, and the powerful magnetic forces that help control them. I used a technique of wet on wet ink here to express the wild nature of the particles and the magnetic forces controlling them. During my residency, I spent hundreds of hours interviewing scientists and other staff at the lab, touring the experiments, taking training and studying. I design my projects as a full immersion experience and with this scaffolding, create accessible art that helps explain what scientists are learning about how particles behave. It has been a great privilege to be inspired by so many dedicated researchers and staff at Fermilab. One of the most powerful lessons I learned with this residency is that I am not afraid to learn any kind of science...even particle physics. This residency offered me an opportunity to create a space where art and science can work together to communicate to the mysteries of the universe. I hope my artwork inspires others to explore their own questions, and to discover for themselves that you don’t need to have a Ph.D. to fall in love with science. Lindsay Olson is Fermi National Accelerator’s first Artist-in-Residence and is on the faculty at Columbia College Chicago. She is known for creating unusual residencies including a stint as the resident artist at Chicago’s Metropolitan Water Reclamation District. Her work has been featured in Scientific American, the Chicago Tribune, SciArt in America and the Chicago Artist Resource. She has shown her work in many galleries in the US and internationally including Germany, Vienna, Athens and Geneva. Her work is now touring both the US and in Europe.